Home Central Linn Spotlight Is It Bullying? Last week in Cobra Club at the Elementary, the discussion was about how each student can help make school a better place for everyone. 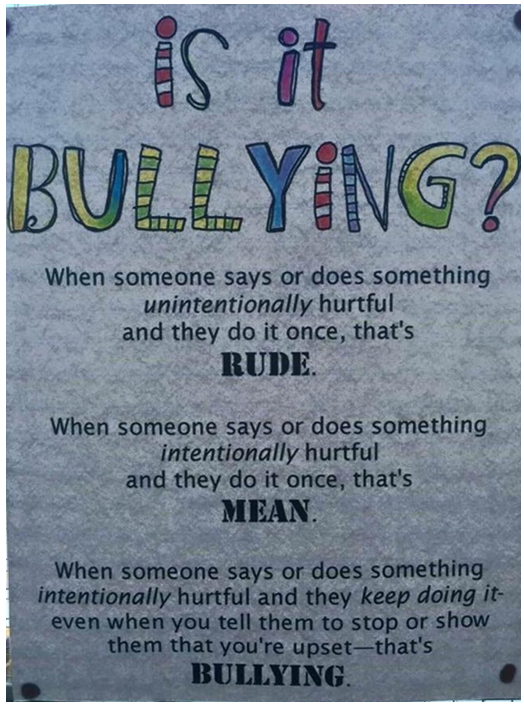 We discussed how to tell when someone is being rude, mean or bullying; and how to react when this happens. This is an ongoing educational process. So you will see this poster around the school. Please talk to your student about what they learned and what their group discussed. Each group is led by a different adult so the discussion may look very different from group to group. It is encouraged that your student take an active part in the process. They may talk about one point longer than another group, depending on what is important to that group. Please contact CLES if you have any questions and Thank you for your continued support.